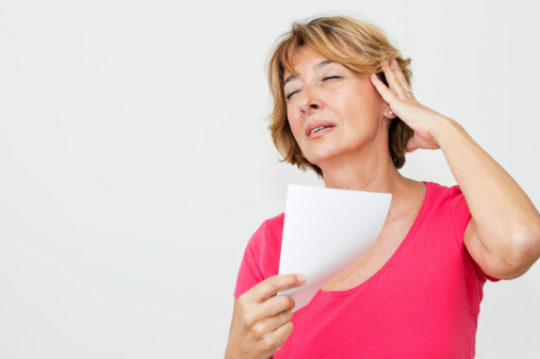 Hot flashes (or hot flushes) are the most frequent symptoms of menopause and perimenopause. They occur in more than two-thirds of North American women during perimenopause. They occur in most women with induced menopause or premature menopause. A hot flash is a momentary sensation of heat that may be accompanied by a red, flushed face and sweating. The cause of hot flashes is not known, but may be related to changes in circulation. Hot flashes occur when the blood vessels near the skin’s surface dilate to cool. This produces the red, flushed look to the face. A woman may also perspire to cool down the body. In addition, some women experience a rapid heart rate or chills. Hot flashes accompanied with sweating can also occur at night. These are called night sweats and may interfere with sleep. The severity and duration of hot flashes varies among women. Some women have hot flashes for a very short time during menopause. Other women may have hot flashes -- at least to some degree -- for life. Generally, hot flashes are usually less severe as time passes. Stay cool. Keep your bedroom cool at night. Use fans during the day. Wear light layers of clothes. Try deep, slow abdominal breathing (6 to 8 breaths per minute). Practice deep breathing for 15 minutes in the morning, 15 minutes in the evening, and at the onset of hot flashes. Adding guided imagery to these breathing techniques can be very helpful. Wear socks to bed (lowers central body temperature). Acupuncture has been used; however, results are mixed. Talk to your doctor about taking systemic hormone therapy (HT), which remains the primary indication to treat moderate to severe hot flashes. In addition, it can help other symptoms of menopause, including vaginal dryness and low bone density. However, all HT carries some risks, including blood clots and gallbladder inflammation. If HT is not right for you, there are other treatments that may offer relief. These include both over-the-counter and prescription therapies. Bellergal-S, a combination medicine, has been used in the past to treat some symptoms of menopause; its use is discouraged, as it contains an addictive barbiturate. Can herbs and botanicals relieve hot flashes? Although some botanical and herbal therapies have shown promise for relieving menopausal symptoms such as hot flashes, more research is needed to determine the benefits and risks of alternative remedies. Because botanicals and herbs may have adverse side effects or exhibit harmful interactions with other medications, it is important to consult with your doctor before taking any of these products. Soy in the form of food products. Plant estrogens, such as isoflavones, are thought to have weak estrogen-like effects that may reduce hot flashes. Isoflavones can be found in soy foods as well as whole grains and beans. Black cohosh. Some studies suggest that black cohosh may be helpful in the very short term (6 months or less) for treating hot flashes, night sweats, and vaginal dryness. Side effects include gastrointestinal upset and reports of liver toxicity. Evening primrose oil is another botanical that is often used to treat hot flashes, although there is no scientific evidence to support this. Side effects include nausea, diarrhea, and blood clots. Many women with other conditions, such as seizures, those on blood-thinning drugs, or those with schizophrenia, should not take evening primrose oil. Flaxseed. Although there is no scientific evidence to support using flaxseed, it is thought to decrease the symptoms of menopause, particularly irritability and mood swings. Also known as linseed, flaxseed is available in both whole seed and seed oil forms. Be sure to talk to your doctor before you take any medications to relieve hot flashes. Also, keep in mind that hot flashes may be temporary. You may be able to manage without any treatment. National Institute on Aging. Hormones and Menopause. www.nia.nih.gov. Accessed December 28, 2010. Carroll DG. Nonhormonal Therapies for Hot Flashes in Menopause. Am Fam Physician 2006, Feb1;73(3):457-464. www.aafp.org. Accessed December 28, 2010. National Center for Complementary and Alternative Medicine. Menopausal Symptoms and CAM. nccam.nih.gov. Accessed December 28, 2010.